Can Cats Eat Rice? Is Rice Safe For Cats? “Can cats eat rice?” You probably ask this question if you want to share some of your rice with your cat for a treat, or maybe you want to help them with diarrhea and tummy troubles, or maybe you want to know more about “fillers” in commercial pet foods. 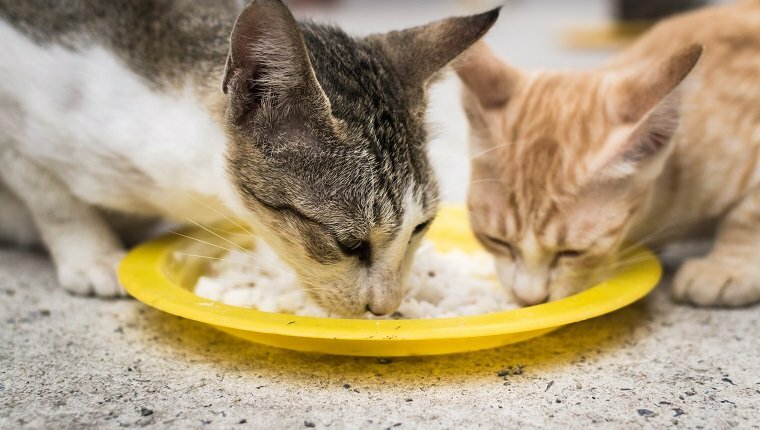 Humans eat rice with many different meals, so is it safe for cats to eat, too? The answer to that question is yes, most cats can safely eat some rice, though there are a few exceptions. You should always ask your veterinarian before feeding your cat any human foods, including rice. Also, rice isn’t a natural part of a cat’s diet and isn’t likely to give them nutritional benefits, so it may be best to avoid feeding them rice, even if it is unlikely to cause them harm in small amounts. 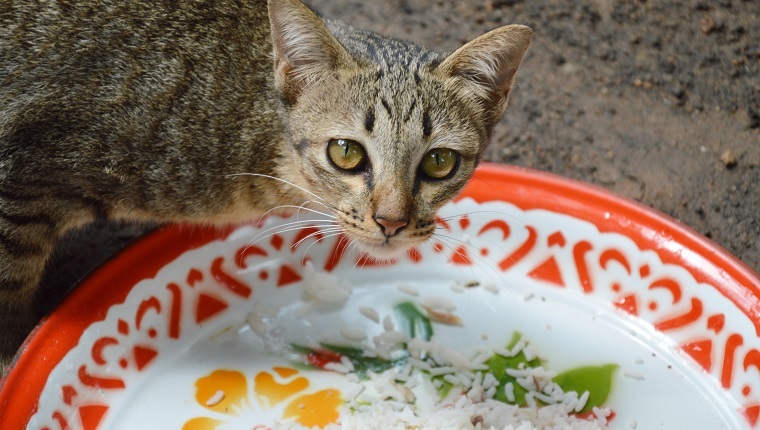 Here is what you should know about feeding rice to cats. It is important to know that cats are obligate carnivores, meaning they get most of their nutritional requirements from the meat that they eat. Rice is, at best, unnecessary for them in most situations. Sometimes cats can feel full after eating rice and lose their appetite for the meat that gives them their proper nutrients. If a cat eats too much rice too often, they may become malnourished. 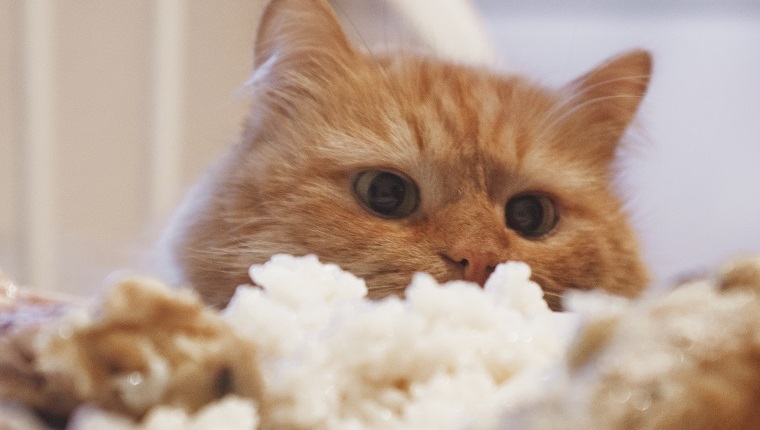 Here are a few other situations where rice can be bad for cats. Uncooked rice. It is difficult to digest and can lead to gas, bloating, and upset stomach. Furthermore, uncooked rice can contain a natural pesticide called lectin, which can cause diarrhea or vomiting. It is an urban myth that uncooked rice will cause your cat’s stomach to explode, but it is still not safe for cats to eat. New food. 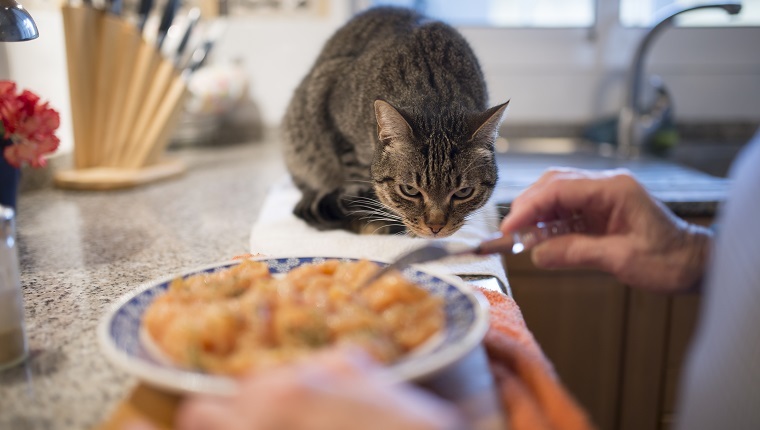 Some cats are particularly sensitive to eating new things. If they aren’t used to rice, they may vomit or suffer from digestion problems. Kittens. Young cats should not eat rice as it can negatively affect development. Seasoning, sauces, or additives. Salt, spices, garlic, onions, and other foods and additives commonly mixed with rice are potentially toxic for cats. If you give your cat rice, make sure it is plain. Commercial pet food filler. Some commercial pet foods use grains, like rice, as filler, which has little nutritional value. If this concerns you, talk to your veterinarian about grain-free foods and proper nutrition for your cat. Both plain brown rice and plain white rice can be good for cats with an upset stomach, so long as it is fully cooked. Vets sometimes recommend mixing some rice in with a cat’s usual food to treat diarrhea. Rice can help firm up your cat’s stools and prevent dehydration. Rice and other grains should make up no more than 25 percent of your cat’s full meal. Follow your veterinarian’s recommendation for feeding rice to your cat. What Are Safer Alternatives To Rice For Cats? If you want to share some human foods with your cat, you should ask your veterinarian which options are safe and healthy. Most food that you share with your cat should be plain and free of additives like salt, sugar, spices, garlic, onions, and other ingredients that may be toxic to your pet. With that said, lean meats are usually a good choice. Plain chicken, liver, lean deli meats, lamb, and beef are typically safe to share with your cat. Cooked eggs and fish, like salmon or tuna, are also good options. Pumpkin, squash, carrots, broccoli, bananas, blueberries, and watermelon can be healthy for some cats, too, in moderation. If you’re looking for a way to help treat your cat’s mild case of diarrhea, many vets will recommend fasting until your cat’s digestive system rights itself. Sometimes they advocate reintroducing food slowly, possibly with rice mixed in. This depends on the cause of your cat’s diarrhea. Pumpkin can be a good source of fiber that will firm up your cat’s stool, and it’s a safe choice of many pet owners for treating diarrhea. Vets may also recommend increasing water intake, dietary changes, adding probiotic supplements to food, or drugs like kaolin-pectin. Do you ever feed rice to your cat? What are some healthy human foods you share with your favorite feline? Let us know in the comments below!